A cocktail dinner or food bar reception is where the format for the evening is like a cocktail party with guests mingling throughout the evening while being served passed hors d’oeuvres from servers who are circulating amongst the guests as well as food bars (or stations). Guests still eat a dinner portion of food throughout the evening – it is just served in different ways and usually over a longer period of time than a more traditional dinner reception. We often want to find out why couples have chosen this format for their reception since the answer will often make it easier for us to design the menu. Do you want to have more fun and offer more variety with your menu? A food bar reception really allows you to theme the entire menu to your family heritage or traditions or your personality. The food and the enjoyment of it is a really big part of a cocktail style wedding – it truly is one of the main features – more so than during a sit down dinner. 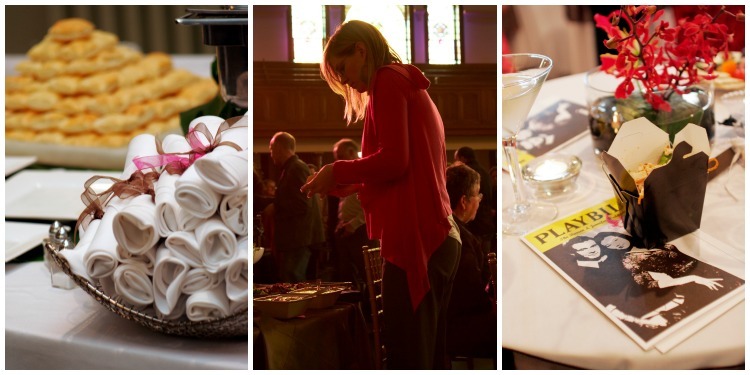 There are many opportunities in the hors d’oeuvres, food bars, desserts, and late night stations to have fun. Are you trying to find the perfect balance between the size of your guest list and the venue you have selected? The venue you have your heart set on may not allow for a sit down or buffet format so a cocktail dinner format can be perfect. You can invite more guests since tables and chairs are not needed for everyone or a formal dining area is not required. Do you want a less traditional/formal feel? More mingling can happen among your guests since they are moving around throughout the evening and have the opportunity to talk to more people than just the people at their table. Are you hoping it will be a less expensive format than a plated or family-style dinner reception? You may need less décor etc such as table linens, chairs, and centerpieces because you are not creating a dining room. This format is not necessarily less expensive than a dinner where the pricing for the food is concerned (see note about décor and rentals above). A dinner quantity of food is still required for all guests and it can sometimes be more expensive to create all the smaller items that are needed for hors d’oeuvres and food bars because there is more variety, more ingredients, and more labour involved. Some older family members may not be familiar with this format and feel uncomfortable or surprised if they are not made aware of the format before arriving. Make sure you have clearly communicated the format to your families before the reception and make allowances in terms of creating comfortable or reserved seating for special members of your family. Stage the food in phases or ‘acts’ throughout the event to keep guests engaged and feeling as if the party is always offering them something new and different. This can build excitement and anticipation of the next thing that is about to be offered or happen during the reception. This can be done a couple of ways. Be sure to provide a variety of seating or ‘areas’ for guests but not exact seating for everyone. At least ½ to 2/3 of guests should be able to sit but the fact there aren’t seats for everyone will keep guests moving around and not thinking that they ‘own’ their spot. Give your guests something to do besides eating, drinking, and mingling. It can be simple. Activities where guests can write a note of congratulations to the bride and groom, answer a skill-testing quiz with questions about the bride and groom, sign the guest book, prepare a story about the bride or groom to be shared during the speeches, or give them a name of a guest they don’t know and task them with finding that person during the evening. Don’t forget that speeches and toasts are important! They can be scheduled at natural breaks or intervals between the food phases or ‘acts’. You can see by looking at the menu below that we started with passed hors d'oeuvres immediately after the outdoor reception. Serving guests a lovely flute of Prosecco or champagne after the ceremony and right before hors d'oeuvres come out is a wonderful way to celebrate with the wedding couple and it also ensures that all guests quickly have a drink and then can immediately enjoy some food without having to stand in a line to get either one. Hors d'oeuvre service can continue while the couple is getting their photos taken. Once the couple returns, this can mark the next phase when food stations 'open'. We sometimes have half the stations open first and then after an hour or so we open the next ones. Speeches or toasts can happen at this time and then the dessert station or dessert hors d'oeuvres can be served following the speeches. A late-night station can open after the dancing has been going for an hour or so and guests need to re-fuel. You can even make a little station where guests can put together their own ‘wedding favour’ treat to take home. 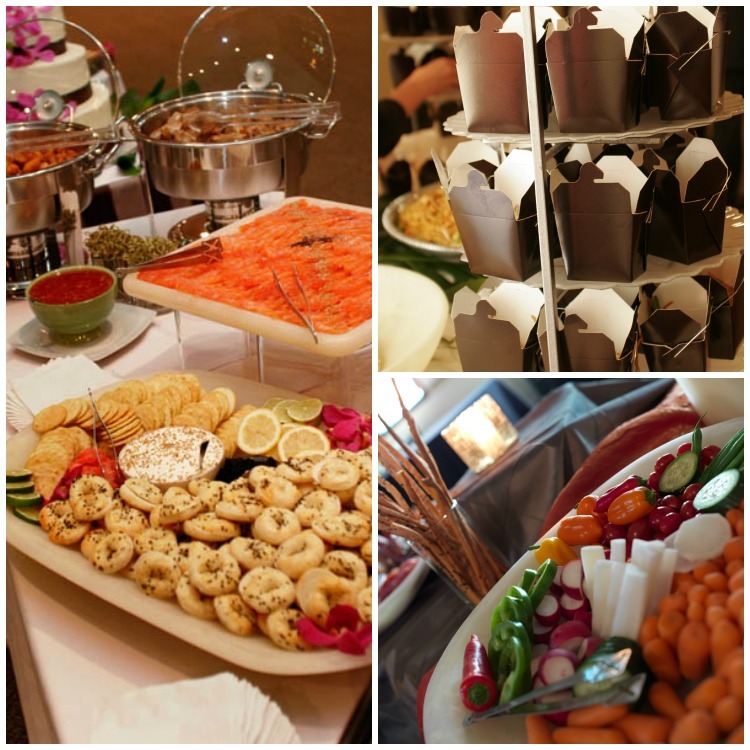 Bountiful platters and interesting food stations will ensure your guests have something to tantalize their taste buds all night long! First Dance will also take place after last speech. My oh my! Bring me some pie! To include chocolate pretzels, Mike and Ikes, Swedish berries, Fuzzy peaches and chocolate covered raisins. Devour to provide bags and boxes for candy. If you are recently engaged and just starting to plan your wedding, be sure to check out the 5 secrets to wedding success and stay current with wedding trends in Calgary . 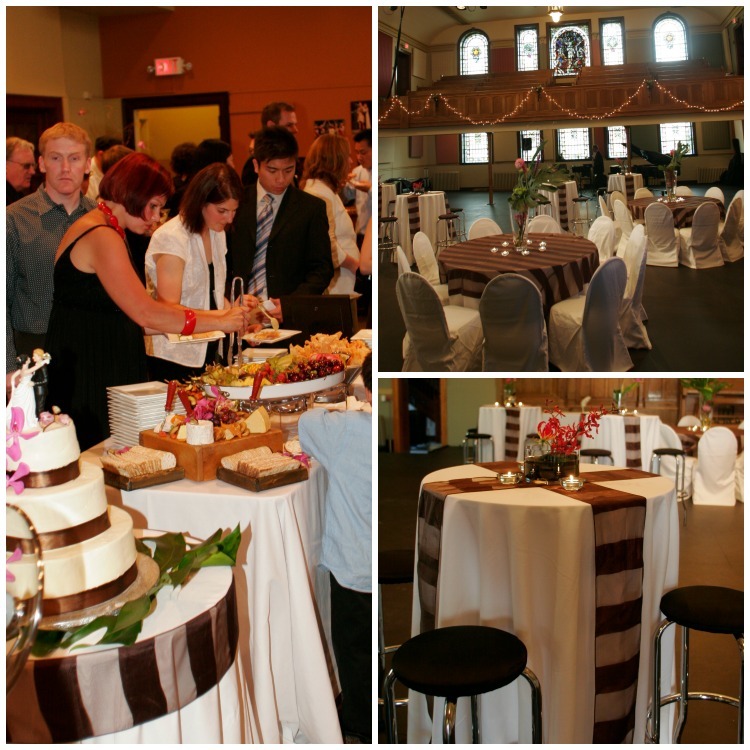 There are so many Calgary caterers to choose from, it can be tough to know where to start. Hopefully we can help you with that - here are 8 things you should know before you hire a Calgary caterer. Thanks for reading and please don't hesitate to contact us - we are always happy to help you celebrate!